Please explain your career path. During my graduate school training in Ted Salmon s laboratory at the University of North Carolina at Chapel Hill, I used quantitative fluorescence live cell imaging to study the mechanisms and regulation of mitosis in vertebrate tissue culture cells. After completing my Ph.D. in biology, I moved to Wake Forest University where I taught light microscopy courses in their graduate program. In 2001, I began my current position as the Microscopy Director for the Department of Cell Biology and the Department of Systems Biology at Harvard Medical School. As Microscopy Director, I oversee two large core light microscopy facilities - the Nikon Imaging Center at Harvard Medical School and the Systems Biology Microscopy Facility. My staff and I advise and train users in a wide range of light microscopy techniques, and I teach light microscopy courses for graduate students at Harvard Medical School. I also teach a series of microscopy workshops in the Nikon Imaging Center that are open to anyone who wishes to attend (for details, go to nic.med.harvard.edu; Educational Program page). I have been involved in several microscopy courses outside of Harvard, including teaching in the Analytical and Quantitative Light Microscopy course at the Marine Biological Laboratory in Woods Hole, MA (www.mbl.edu/education). What is the role of the CSU system in your core facility? We have three Yokogawa spinning disk confocals in my facilities - two CSU-10s and one CSU-X1. These instruments are used for many different research applications by the scientists at Harvard Medical School. There are currently 35 different laboratories using our systems. Light microscopy education is now the focus of my career. However, I do collaborate on research projects on occasion.In 2007, John Murray (University of Pennsylvania), Jason Swedlow (University of. Dundee) and I published a paper in which we quantitatively compared various performance characteristics of widefield fluorescence microscopy, deconvolution, point scanning confocal, and the Yokogawa spinning disk confocal (Murray, JM, Appleton, PL, Swedlow, JR, Waters, JC: Evaluating performance in 3-D fluorescence microscopy. J. Microscopy 2007, 228:390-405.). We measured photon collection efficiency, image signal to noise ratio and image contrast using a test specimen in which we varied the amount of out-of-focus fluorescence to mimic the wide range seen in typical biological samples. These data allowed us to offer guidelines for choosing the “best” technique for a particular application, which depends on strongly on the sample background to signal ratio. Mammalian cells expressing mEmerald-EB3 and mCherry-histone. Cell line generate by Mike Davidson (FSU). Images were collected by students using a CSU-10 during a live cell imaging course at the Nikon Imaging Center at Harvard Medical School. How did you learn about the CSU? I was introduced to the Yokogawa spinning disk confocal by my graduate advisor, Ted Salmon (UNC Chapel Hill), and another former Salmon lab member, Clare Waterman-Storer (National Institutes of Health). How do you feel about the CSU after actually using? The Yokogawa spinning disk confocal is an excellent choice for high resolution live cell imaging applications of specimens in which removal of out-of-focus fluorescence is necessary. Good points: The CSU allows for (relatively) light efficient confocal imaging of live specimens using high resolution optics. Efficiency of photon collection is extremely important in live imaging, as it both allows for faster acquisition of dynamic specimens and helps to reduce photo-toxicity and photo-bleaching. In my experience, a wide range of live specimens tolerate CSU illumination very well. Bad Points: While we found the CSU to be much more light efficient than the point scanning systems we measured ( J. Microscopy 2007, 228:390-405), it was still several fold less efficient at collecting photons from the focal plane than widefield fluorescence microscopy. There is therefore room for improvement! The CSU multiple pinholes with a fixed size of 50 microns each also allow quite a bit of out-0f-focus fluorescence when using low magnification objective lenses and/or when working with thicker specimens having very high levels of out-of-focus fluorescence. I enjoy my current position very much, and expect to be teaching light microscopy at Harvard Medical School for a very long time! I plan to continue to develop the educational program we offer to meet the growing needs of our research scientists. What do you do when you re not in the lab? I spend most of my free time with my family (my partner Dan and his beautiful daughters, Megan and Ashley) at our home just outside of Boston in Needham, MA. I enjoy cooking for my family, vinyasa yoga, and traveling. In talking about the history, the first CSU10 in the USA was installed at Dr. Shinya Inoue s lab. at the MBL, Woods Hole as early as in 1997 and Professor Ted Salmon got to know about the CSU from Dr. Inoue. Actually Shinya and Ted are the pioneers to use the CSU in live cell imaging and have discovered significantly reduced photo bleaching and photo damage in the live imaging with the CSU. 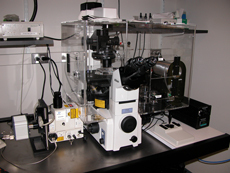 Ted has been extensively using the CSU10 in his Cell Biology research for a long time. Jennifer and many of Salmon Lab. alumni researchers are experts in live cell imaging and have always been the greatest users of the CSU. 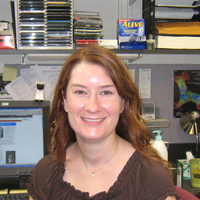 It is our great pleasure to find Jennifer s great contributions not only to assist HMS researchers for excellent imaging but to educate imaging people as a whole! Nikon Imaging Center at Harvard Medical School. Waters, JC. (2009) Accuracy and precision in quantitative fluorescence microscopy. J Cell Biol 185 :1135. Murray, JM, Appleton, PL, Swedlow, JR, Waters, JC: Evaluating performance in 3-D fluorescence microscopy. J. Microscopy 2007, 228:390-405. Waters, JC and Swedlow, JR. Interpreting fluorescence microscopy images and measurements. Cell online, 2007. Waters, JC. Live cell fluorescence imaging. In "Digital Microscopy, 3rd Edition". G Sluder and DE Wolf , Eds. 2007. Elsevier Academic Press, London.